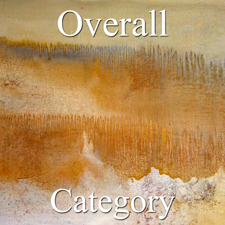 The Overall Winning Artists Category consists of the 10 Best Entries received from the 3 different media categories of the Painting & Other Category, Photography & Digital Category and 3 Dimensional Art Category. The winning artists will now be featured on the Light Space & Time website for the month of January 2017 and thereafter, the artworks and links to the artist’s websites will remain online in the Light Space & Time Archives. Congratulations to our artists who made our 6th Annual “All Women” Art Exhibition so successful this month. At any time, we invite our winners and other interested visitors to link their websites to the Gallery’s Archive section for further ongoing promotion. The Light Space & Time Online Art Gallery will have digital “All Women” Award Certificates, Event Postcard, and Press Releases sent to the winning artists within the next week or so. Thank you to all of the artists who participated and for being a part of the gallery. To return to the All Women Home Page here. Carolyn WarmSun lives in the hills of Oakland, California. Carolyn grew up in rural southern Indiana and obtained her Bachelor’s Degree at Southern Illinois University and her Master’s Degree from the University of Illinois in Champaign-Urbana. She has worked in the field of mental health for many years before beginning a career in Organization Development Consulting. She now paints full time. She worked with Stanley Mock from 1991-2000 to learn stone sculpting. Tendonitis in both wrists required that she stop. She then began taking watercolor classes at her local high school, followed by four semesters of watercolor painting classes at a local Community College after she retired. Jennifer C. Bongiorno has been a professional photographer for more than 17 years. It all began in the 1980’s with her beloved first camera, a Kodak Fisher Price. Over the past two decades, she’s photographed everything from weddings and portraits to government ceremonies and landscape photography. Jennifer graduated with an Associate’s Degree in Visual Arts from Mercer County Community College in 1997. From 2000 to 2005, she worked as the official photographer and Director of Photography for the New Jersey governor’s office. In her role there, she photographed press conferences, official and private events. Today, Jennifer continues her photography journey capturing timeless landscapes using her Nikon D810. With her eye for detail, composition and natural lighting, Jennifer’s love of children, nature, astronomy and photography shines through the camera. Jennifer won Honorable Mention from the International Photography Awards for Waterford and Light the Way 2. In addition, Jennifer has won multiple awards from Light Space & Time Online Gallery. She is currently a member of the South Jersey Camera Club. Sue Majewski is a mosaic artist living in the metropolitan Detroit, Michigan area. Her background in art began with a Bachelor’s Degree in graphic design from Wayne State University and she continues her studies through workshops and online learning experiences. The process of creating mosaics, in its many different forms became a way to share her creativity many years ago and continues to evolve. She teaches mosaic art classes, shows work in local galleries and her artwork has appeared in publications and competitions. From my heart, through my hands, with an enthusiastic layover in my imagination, inspiration seizes me. It is my passion for life that inspires me to create. My creativity is sparked by the materials that surround me and by the infinite world of imagination and wonder. To share that world of mystery and magic is my absolute sheer delight. Lively, effervescent color rhythmically pulsates through the paintings of American artist Paula Montgomery. Beginning each composition with a particular hue or design, Montgomery then lets her materials and concept guide her process as she produces unique and texturized canvases. Primarily focusing on flora as a subject, Montgomery passionately transforms everyday flowers into painterly visual poems. Paula utilizes either a lithe, expressionistic brushstroke or a purposeful palette knife, the artist boldly applies paints with a poetic flourish. Unwilling to limit herself to traditional materials alone, Montgomery embraces mixed media techniques and materials in order to accumulate the abstract quality of her works. Thus the paintings hover gracefully between abstraction and representation. Elegant and independent, these paintings exude a sense of peace and joy. A lifelong resident of the Pacific Northwest, Lou Ann Goodrich currently resides in Oregon where she maintains forested acreage preserved for wildlife. She is a proponent for a balanced environment and habitat conducive to maintaining diversity and sustainability for wildlife and the natural world. Animals have always been a large part of her life and after retiring from a career in medicine she pursued photography to record and express the beauty of nature. Now a passionate nature and wildlife photographer, she particularly strives to portray species specific behavior in her images. Recently, she has diversified and added digital photo artistry to her skills which allows an additional creativity and artistic presentation of her images. Although new to the art world she is gaining recognition through published images and awards in photography and digital art. Patricia O’Brien’s contemporary oil portraits and figurative paintings are created to capture the essence of the human spirit; they evoke expressions of humor, surprise, fear, and the spectrum of emotions we all experience and show the world, even if we aren’t aware that we do. By manipulating the tools available to an artist, experimenting with palette and brush stroke, these emotions are realized and a personality is coaxed from her canvas. Her work tells a story, encouraging the viewer to discover the narrative. By taking traditional portraiture, amplifying the color wattage, injecting unexpected pairings, and an occasional sprinkling of wry humor, she has created her unique style. Her recent work, the man/women and beast series, is a testament to this signature style. The collection features an individual, an animal, and a hint of comedy. Her path from electrical engineer to self-taught artist trained her to analyze, to experiment, to test ideas, and to challenge herself when creating her contemporary work. She began her professional art career as a muralist. Through ongoing classes and critiques, she continues to refine and expand her skillset. Painting public and private murals provided a unique opportunity to interact with viewers while painting onsite, providing immediate feedback. This enabled her to see viewers search the images and observe their reactions firsthand. Mural work also afforded her an opportunity to explore various subject matter, such as cityscapes, landscapes, florals, and more, depending on her clients’ needs. After directing her energy to works on canvas, she relished the challenge to develop her own interpretation of the human form, and it captured her heart. Each new piece of artwork begins with the most essential feature – the eyes, the windows to the soul. They set the mood, and begin the story. The supporting elements in the composition are selected to concisely complete the narrative. Catherine King is an American digital artist and photographer artist based in Northern Nevada and California. She strives to tell stories through decorative, historical, and inspirational art work. Her goal is to engage her viewer’s imaginations, getting them to linger a little longer picking out a detail or a story in one of her pieces. Stories, histories, fantasies from childhood, over-the-top cinema, art history, literature, and music with clever lyrics are all her inspirations. Second only to creating art, she is inspired by her travels around the world. One of the strongest motivators that drives an artist to create, is the impulse to express and capture the emotional truth to either an idea, a place or a time. Wendy Fee’s vi-brant, dynamic paintings are her response to the ever-changing landscape of natural elements that inspire her both at home and when travelling. In 2013, Wendy became a member of The Montreal Art Centre, a community of sixty artists whose studios are located in a historic building in Griffintown, Montreal. This con-temporary artist’s abstract works are created in her studio space and reflect her signature use of textures and layers using a variety of aqua media such as watercolour, inks, acrylic paints and mediums. By nature, watercolour is uncontrollable, and Wendy embraces the freedom and risk-taking of this new range of materials. Wendy has been expressing herself artistically for over thirty years, yet the path to pur-sue art on a professional level has been as unpredictable and flowing as the paint that washes over her canvases. Sketching and drawing in her formative years, after graduating high school she was ac-accepted to Goddard College in Vermont, a “one of a kind institution of higher education with a history of creativity and chaos, invention and experimentation.” Being part of a free-spirited generation, Wendy declined the opportunity in favour of travel and experiencing “life”. Her husband of more than thirty-five years, together have since raised a wonderful family, pursued careers and have never taken opportunities and good fortune for granted. Originally from Montreal, Wendy obtained an Executive MBA from Athabasca University in Alberta and a Postgraduate Diploma in Event Management from Fitzwilliam Institute in Dublin, Ireland. Currently residing in Bainsville, Ontario, she enjoyed a successful career as a Senior Sales and Marketing Manager in the health care industry before deciding to launch her own event planning business in 2009, Chain of Events, operating as President, Owner and Founder. When Wendy chose the name of her company, it was in the spirit of “one thing leads to another” and in 2015 launched Chain of Events Studio with enthusiasm, transitioning from the business world to pursue art on a professional level. Wendy is an intuitive painter and shares a passion for colour, fashion, beauty and sim-ply her joy of life. Growing up, Wendy’s family spent time outdoors, skiing in the Laurentians during the winter and spending the summer months by the ocean. Wendy is drawn to the drama of the colours in nature, with sunsets and water a constant source of fascination. Since making the decision to pursue art on a professional level in 2015, Wendy’s debut solo show Natural Elements took place at The Montreal Art Centre, and more recently in September 2016, Wendy showcased Escape! Abstract Explorations of Land, Sea & Sky. This new body of work was inspired by four months living aboard a boat with her husband where together, they navigated the Intracoastal Waterway, crossing the Gulf Stream to the Bahamas and spending a month in the remote Berry Islands. In addition, one of her mixed-media art pieces was selected for publication September 2016 in In-cite 4:Relax.Restore.Renew. Susan Oakes is a freelance graphic artist and art instructor who draws from a diverse background of psychology (B.A. ), business, (management) art and technology. She has taught art at Briarcliffe College in NY, as well as Palm Beach State College and the School District of Palm Beach County in addition to many private students. In my work I blur the borders between photography, painting, and digital illustration and reveal that art and technology are not antagonistic, but can coexist and be used to enhance each other in new and exciting ways. Although my art is a product of computer hardware and software, it is not the result of anything “automatic”, and is developed from my original photography. There is no “formula” or automatic process; no two pieces are done in exactly the same way. I create my pieces using a variety of medium. It all depends on the effect I’m seeking. I discovered a relatively new medium! ALCOHOL INKS! I was completely hooked from day one. This medium is so fascinating and fun to play with. It’s gotten to the point that I can’t stop exploring and discovering the marvelous way the inks move. It has become a mission to share this delightful medium and techniques with others. I am fulfilling this by exhibiting my pieces, teaching both artists and non-artists how fun creating with alcohol inks can be!